The Brazilian real rallied against the US dollar today after the Federal Reserve released a dovish policy statement and Brazil’s central bank cut its key interest rate. 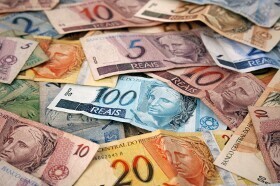 The Central Bank of Brazil cut the Selic rate by one percentage point to 9.25%, in line with expectations. It was the first time since November 2013 when the interest rate was set below 10%. Moreover, the central bank signaled that it may continue monetary easing at the same pace at the next policy meeting. USD/BRL sank 1.07% to 3.1384 as of 9:30 GMT today.